PBR - The Marlins have done it again. A year removed from an Opening Day payroll of nearly $100 million the club is again in the midst of a fire sale and owner Jeffrey Loria isn't holding anything back. 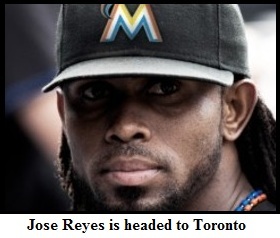 According to several sources the Marlins have agreed to send starters Josh Johnson and Mark Buehrle, shortstop Jose Reyes, infielder/outfielder Emilio Bonifacio and catcher John Buck to Toronto in what appears to be the largest trade in baseball history. In return, the Marlins will receive shortstops Yunel Escobar and Adeiny Hechavarria, major-league right-hander Henderson Alvarez, minor-league left-hander Justin Nicolino, center fielder Jacob Marisnick, catcher Jeff Mathis and minor league right-hander Anthony DeSclafani. The deal was agreed upon on Tuesday night but has not been officially confirmed by either club. Once finalized the Marlins' payroll will drop to near $16 million. Including an earlier trade of Heath Bell, the Marlins will have shed nearly $190 million in future salaries this offseason. The moves all come less than a year after the club opened a new stadium in Little Havana. Including a parking structure, the stadium cost approximately $634 million to construct and was funded primarily by public tax-dollars. "Alright, I''m pissed off, plain and simple," tweeted Marlins outfielder Giancarlo Stanton after hearing of the deal. Reyes and Buehrle were both brought to Miami last year as a means to make the club competitive and to increase fan interest, but the season quickly turned disastrous and the club finished last in the National League East at 69-93. According to Baseball Reference, the team ranked 12th in the National League in attendance. The Marlins underwent similar salary dumps following the 1997 and 2004 seasons, but neither was as bold as the current sale.